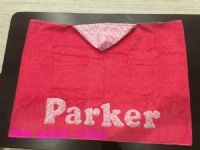 This Toddler Hooded Towel can start being used from 8 months old until at least 5-6 years old. The hood and name uses the same fabric!!!! !